Some positive movement on executive payments comes from AGL's managing director. Michael Fraser, who has agreed not to assert his entitlement to any payment of short term incentive if his appointment is terminated for unsatisfactory performance. The move follows concerns from some institutional investors and proxy advisers about Mr Fraser's entitlement to be paid a pro rata amount of up to one-half of his maximum short term incentive opportunity if his appointment were to be terminated for unsatisfactory performance. Simon Potter has resigned as a director of Dart Energy. In August he resigned as chief executive and managing director to return to the UK. At that time Nick Davies, the current chairman, moved temporarily into an executive chairman role to cover the transition period until a new chief executive is appointed for Dart Energy International. Prior to the demerger of Dart, Mr Davies was chief executive and managing director of Arrow Energy and oversaw its transformation from a start-up with a single pilot project to a multi billion dollar global gas producer. Envestra said gas volumes for the domestic market during the first three months of 2011-12 were 7 per cent below expectations, resulting in a reduction in revenue of around $5 million. The company's full-year result will depend on normal weather occurring throughout the remainder of the year. The company has maintained its earlier guidance of a profit after tax of around $60 million for 2011-12, a 33 per cent increase over the previous year. Speaking at the company's annual general meeting, chairman, John Allpass, also confirmed previous guidance that dividends for 2011-12 will be 5.8 cents per share, a 9 per cent yield on the current share price. The next dividend is 2.9 cents on 28 October. The company recently announced it had raised $25.7 million in the first half of 2011-12 via its dividend reinvestment plan. Shareholders representing over 60 per cent of the issued capital participated. A security purchase plan closes on 28 October. Envestra has executed a $235 million syndicated loan agreement with Australian and international banks with the funds to be used to repay loans that mature in mid-2012. Envestra will then have no currently drawn loans maturing before July 2014, other than small amounts of commercial paper. Envestra's average debt maturity is now 11 years with term-debt maturities extending through to 2042. The company expects to invest $200 million during the year expanding its networks and connecting over 25,000 consumers, as well as continuing its program of replacing old cast iron and steel mains. and other parts of the networks. At $23 per tonne the tax works out to about $8 per domestic customer, which Envestra expects to pass this through. The carbon price will also make gas more competitive with electricity. Envestra said that coal seam gas is unlikely to have a material impact on the superior emissions performance of gas compared to coal. Managing director, Ian Little, said "There has been a lot of unhelpful, and at times inaccurate, commentary on emissions during the course of the carbon debate, including that made by certain political interests, questioning the superior position of natural gas in terms of CO2 emissions compared with that of coal, particularly where the gas is being produced from coal seam methane fields. "There is no doubt that natural gas has a significantly better carbon footprint than any current coal fired generation, with the extent of the improvement largely depending on whether the comparison is being made to black, or brown coal fired power stations. GWA Group said revenue from continuing operations for the three months to 30 September was flat compared with the same period last year, with a 10 per cent reduction in like for like sales offset by the inclusion of sales from the recently acquired Gliderol garage door business. Although previous guidance for the full year was a reduction in underlying sales of 3 to 4 per cent with the decline skewed towards the first half of the year, the first quarter reduction was greater than expected. "Market conditions have deteriorated and first half year sales are expected to be 8 to 10 per cent below the comparable prior period on a like for like basis," said managing director Peter Crowley. "Total sales for the half year, including Gliderol, will be similar to last year and trading EBIT is expected to be down 5 to 10 per cent for continuing operations." The greater than expected decline in sales was largely due to deterioration of sales in NSW where some improvement in housing activity had been expected after the state election; sales of environmental water heaters in the Dux business was down 40 per cent due to a shift back to lower value traditional electric and gas storage water heaters; and the decline in the renovation market in line with other areas of discretionary spending. "We are working on targeted market initiatives and accelerating cost reductions to offset the market decline and will provide full year guidance at our half year results announcement in February," said Mr Crowley. "Operating cash flow has remained strong and we do not see any circumstances which will impact our dividend policy to maintain ordinary dividends at 18 cents per share for the year." GWA will exit its Caroma North American business to focus on its Australian Building Fixtures and Fittings businesses. Caroma North American is small and has been marginal in recent years. The exit will be completed early in calendar 2012 and is expected to release around $5 million in working capital to reduce debt. The sale of the Sebel Commercial Furniture business was completed on 30 September. The proceeds of $23 million was slightly less than previously reported due to lower working capital at completion date. A net loss after tax of between $7 million to $8 million will be reported as discontinued operations for the half year including the impact of divesting both Sebel and Caroma North America. Restructuring activities announced in August are progressing to plan, said Mr Crowley. The Wetherill Park vitreous china plant is now on a single shift, and the Gainsborough plating and die casting operation at Blackburn will cease operation in May. "We expect a 5 per cent to 6 pr cent reduction in our total workforce by December 2011 with the previously forecast 8 per cent reduction to be achieved by June 2012." "The sale of our Coburg warehouse in Melbourne and Norwood factory in Adelaide are also progressing to plan and these are expected to be completed by early 2012. It is anticipated that these property sales will largely offset the cash flow and after tax profit impact of the restructuring activities." Mr Crowley said the decline in market conditions reflects the business cycle rather than an underlying weakness in the business. Ceramic Fuel Cells won the Minerals and Energy Award' at the 2011 Governor of Victoria Export Awards. The Minerals and Energy Award' is one of twelve categories at the annual Export Awards. As a category winner, Ceramic Fuel Cells is a finalist in the 49th Australian Export Awards, to be announced in Brisbane on 8 December. AFT Corporation posted an $800,000 profit after tax for the first half of 2011, which compares with the total annual profit in 2010 of $1 million. Sales turnover for the 6 months was $13.4 million. The first half results were boosted by a surge in sales due to the 30 June deadline for the closure of the solar panel feed-in-tariff in NSW. However, the company expects sales revenue in the second half will be significantly lower than forecast due the changes to feed-in-tariffs in NSW, ACT and WA. Chief executive, Stone Wang, said these will impact to the industry as a whole. "The management continues to explore additional revenue streams to complement the existing product mix," he said. There's only two certainties about the direction of energy prices - renewables are getting cheaper and traditionally sourced energy can only get more costly, says Gerry McGowan, managing director of CBD Energy. "We don't need government subsidies to make solar energy competitive, technology has done that for us," he said. The introduction of new technology and cheaper ways of making solar panels is leading to plummeting solar prices while coal sourced energy prices continue to increase. "The sun's rays cost nothing and today's systems involve far less cost and are more effective, while everyone can see their quarterly energy bill going higher all the time," said Mr McGowan. Energy in NSW now costs between 20 and 30 cents a kilowatt hour, reaching 43 cents at peak, while solar energy costs 5 cents. With the Independent Pricing and Regulatory Tribunal, which governs electricity pricing in NSW, already having approved a 17.6 per cent lift in prices for 2011, the differential with solar is set to widen further, he says. The cost to install a solar system ranges from $2,000 to $12,000, depending on the size of system, giving a payback period of six years at projected electricity prices. In January 2010, the NSW government introduced a feed-in tariff scheme but the scheme was so popular that it had to be closed 10 months later, with disastrous effects on the solar industry and scaring many off using solar energy. Energy Developments is to raise $26 million at $2.45 per share to partially fund organic project expansions now underway and enhance its balance sheet following the $101 million acquisition of enGen. The equity raising is a 1 for 15 accelerated non-renounceable entitlement offer with an institutional component and a retail component. The offer is not underwritten and no excess shares will be issued. Energy Developments' largest shareholder with 78 per cent, Greenspark Power Holdings, will subscribe for its full entitlement. The company said it is also undertaking a detailed review of the government's Clean Energy Future Legislative Package (CELP) that was passed by the House of Representatives on 12 October. While it is too early to assess the potential impact on the company, certain areas may have potential negative implications, it said. These include the potential termination, discontinuation or amendment of the NSW Greenhouse Gas Abatement Scheme (GGAS) and associated loss or material reduction of NGAC (NSW Greenhouse Gas Abatement Certificate) revenue; and CELP costs and liability for non-landfill gas power generation emissions from the company's waste coal mine gas, natural gas and diesel power generation operations if these costs cannot be passed through to counterparties under existing medium to long term contracts. These potential negative implications may be partly offset by transitional arrangements proposed by the Federal Government and any transitional arrangements proposed by the NSW Government as part of the potential termination of the GGAS scheme when CELP commences; plus any positive outcomes from commercial negotiations with the company's key counterparties including waste coal mine gas suppliers, electricity retailers and other off-takers. The company said the current market for NGACs is illiquid given the uncertainty surrounding the CELP and the future of GGAS. Recent limited NGAC sale transactions have been at historic lows, and at prices significantly lower than the company's current average book NGAC inventory values. ERM Power has appointed Tony Bellas as independent chairman. He replaces ERM's founder, Trevor St Baker, who continues as a non-executive director and as a consultant. Mr St Baker said it was time to make the change following the release of its first year's financial results. "ERM Power has a strong Board with well credentialed and experienced independent directors, and we will now have an independent chairman, enabling ERM to meet all ASX governance guidelines," he said. Mr Bellas is an experienced public company director with a background in the industry, having been chief executive of Ergon Energy and prior to that chief executive of CS Energy. He had a prior career in the Queensland Treasury, and was Deputy Under Treasurer where he had a significant role in energy policy and energy industry regulation. Mr St Barker has acquired 196,409 shares for $262,500, an average price of $1.35 per share under the dividend reinvestment plan. Algae.Tec has received development approval under the Shoalhaven City Council's Environment Planning and Assessment Act for its algae to energy demonstration facility, Shoalhaven One. Shoalhaven One will be next to the Manildra Group's industrial facility near Nowra, south of Sydney. Manildra Group is the nation's largest ethanol producer. The demonstration plant will use Algae.Tec's modular technology that captures carbon dioxide waste and feeds it into the algae growth system. "The Algae.Tec algae photo-reactors will take a carbon dioxide feed from the ethanol fermenters," said Algae.Tec executive chairman Roger Stroud. The photo-bio reactors are being assembled at the company's US headquarters, the Algae Development & Manufacturing Centre in Atlanta, Georgia, an 18,200 square foot fabrication facility. The Shoalhaven City Council approved the Algae Demonstration Plant for the evaluation of algae production and processing for alternative fuel and CO2 sequestration. The permit is effective immediately and valid for the next three years, at which time an application can be made for an extension. "Algae.Tec is one of few advanced biofuels companies globally with an enclosed modular engineered technology designed to grow algae on an industrial scale and produce biofuels that replace predominantly imported fossil fuels for transportation use," said Mr Stroud. AnaeCo has placed $2.5 million worth of shares at 5 cents each, the first part of a planned $5 million capital raising. The remaining $2.5 million will be raised through a shareholder share purchase plan with shareholders able to purchase up to $15,00 worth of shares each. Details will be announced in due course. Funds from the capital raising will be used for working capital during the WMRC DiCOM Expansion Project, industrialization of the DiCOM technology, business development costs and repayment of a short-term loan facility. The capital raising is managed by Bizzell Capital Partners. Firm commitments for 50 million shares have been received from sophisticated and professional investors. 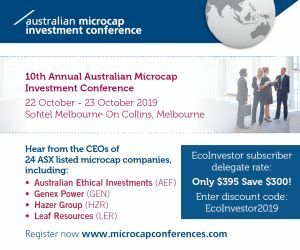 Approximately 30 million placement shares or around $1.5 million are being subscribed for by parties related to Shaun Scott, Les Capelli and Dr Ian Campbell, directors of AnaeCo. The issue of these shares is subject to shareholder approval at the company's annual general meeting. Carbon Polymers Limited has been awarded a Victorian Government tender to supply granular crumb rubber to Sprayline Services, the commercial contracting arm of VicRoads responsible for bitumen resurfacing. Sprayline utilizes rubber from recycled tyres and bitumen. This method is environmentally friendly, reduces water penetration, increases aggregate retention and reduces reflective pavement cracking. The contract is to supply 2,000 tonnes of granulated rubber to Sprayline in Victoria, South Australia and New South Wales. It is a pre-qualified supplier to the road authorities in these states. Sprayline operates from five Victorian delivery centres. It is a member of the Australian Asphalt Pavement Association, the Civil Contractors Federation and the Road marking Industry Association Australia. CBP said it is negotiating with several manufacturers of bitumen products that utilize rubber. "This supply arrangement will further build on our existing sales and reinforce our position as the largest listed manufacturer of crumb rubber products in Australia," said chairman and group managing director, Andrew Howard. Carnegie Wave Energy has welcomed the UK Government's proposal for increased support of wave energy, which will see wave projects receive more than 5 times the tariff of onshore wind projects. The UK Department of Energy and Climate Change (DECC) consultation sets out the Government's proposals for levels of tariff support for the period 2013-17. While some renewable technologies, such as onshore wind and solar PV, will have their support levels reduced, wave will receive 5 Renewable Obligation Certificates (ROCs) per MWh - or a sale price of over of 40c/ kWh - up from the current 2 ROCs. The UK Government's 2011 Renewable Energy Roadmap identifies marine energy as one of the technologies which have either the greatest potential to help the UK meet the 2020 renewables target in a cost effective and sustainable way or offer great potential for the decades that follow, said Carnegie. The Roadmap estimates that commercial-scale wave project deployment is expected to increase through the second half of this decade, reaching in the order of 200-300 MW by 2020 and possibly as high as 27,000 MW by 2050. To date, the UK Government has supported marine energy with £100 million of grant funding. Another £20 million of grants to support the deployment of pre-commercial array demonstrations was released in June 2011. Further grant funding for innovation in wave and tidal energy is planned by other bodies such as the Energy Technologies Institute, the Technology Strategy Board and by Devolved Administrations such as the Scottish Executive. Carnegie recently completed a detailed assessment of suitable sites around the UK for CETO wave energy projects greater than 10 MW. Renewable Obligation Certificates (ROC) are issued for eligible renewable electricity generated in the UK. ROCs are currently valued at £45 each, meaning that the 5 ROC wave tariff translates to approximately £225/ MWh or $360/ MWh (36c/ kWh) on top of the wholesale power price. Cell Aquaculture is to commence a new production project in Malaysia. The company said it has been working for some time with a well funded, private Singapore based consortium, with a view to establishing a joint venture Cell' production facility. A search for a suitable site in Singapore was unsuccessful, but one just over the border from Singapore, in Johor, Malaysia, has now been secured. The partners said they are well advanced on progressing the project and entering commercial production as soon as possible, with Stage 1 development now commenced. The project will be developed in three stages. Stage 1 is 100 tonnes of barramundi production, Stage 2 is expansion to 300 tonnes of production, and Stage 3 is expansion to 500 tonnes with 300 tonnes of barramundi and 200 tonnes of high value grouper. Cell Aquaculture will hold 20 per cent equity in the venture and will earn this equity via a nominal capital investment and consulting and services to the joint venture. The company said the most important aspect of the venture is to secure further barramundi supply to fulfil overwhelming demand in the new markets currently being created via subsidiary Cell Aqua Foods Pty Ltd. It is negotiating a buy-back' agreement for the majority of produce from the joint venture, which will significantly bolster its Premium Barramundi inventories to capitalize on the current market. Cell Aquaculture said it achieved record revenues for the September quarter of $302,000. Dyesol says it is a significant step closer to commercializing the outcomes of a joint research agreement as Stage 2 of the three-stage, two year Dyesol/ CSIRO research and development program funded by CSIRO's Australian Growth Partnership is now complete. The milestone focused on the design and creation of novel structures starting with the engineering of key components or ligands and their uses in generating novel dyes to improve the performance and stability of DSC systems. Dyesol said project scientists optimized the synthetic chemistries to generate quantities of key precursor materials for ligands and novel Ruthenium based dyes. The investment arrangements ensure Stage 3 budgeting and resourcing are on track to complete the project. In this stage, Dyesol and CSIRO scientists will expand on the preceding research work, with CSIRO evaluating the materials in DSC devices and Dyesol focusing on up-scaling the materials developed in Stage 2. Dyesol director Gordon Thompson said "The materials developed during this joint collaboration have the potential to significantly advance the commercialization of DSC in a range of applications where performance and stability are essential requirements." Meanwhile, Dyesol has hosted the prime minister, Julia Gillard, who toured its headquarters, laboratory and engineering facilities in Queanbeyan, NSW to learn more about the company's solar energy technology. The Prime Minister was greeted by around 50 Dyesol scientists, engineers and support staff. Director and joint founder, Sylvia Tulloch, explained why dye solar cell (DSC) technology is classified as a disruptive technology and a game changer for the solar industry. "By replacing conventional building facades or steel roofing sheets, with building materials that have Dyesol's dye solar cell technology imbedded into their fabric, without the need to fit conventional solar panels at additional cost, we see exciting opportunities for cost-savings and large-scale integration." said Mrs Tulloch. DSC employs nanotechnology to create electricity directly from light by mimicking the process of photosynthesis. Eco Quest is cutting costs and may diversify into a complementary business. The company said it recognizes that business operations have not generated the sales that had been expected. "Under these circumstances, it has been decided to contract operations to reduce the cash burn. Accordingly, Mr Keith Herbert has resigned as managing director but has agreed to support the company's future expansion beyond Australia. Other roles are being eliminated and/or combined." The board has commissioned an independent review of the business, and is also considering the acquisition of a complementary business, it said. Shares in Eco Quest hit an all time low of 0.8 cents on 20 October. The all time high was 21 cents in September 2009. The French Government has confirmed that European Gas is not affected by the country's ban on fraccing. The validity of all of European Gas' exploration permits in France have been confirmed by the French Ministries of Energy, Environment, and Industry. On 13 October France issued a list of explorations permits that have been abrogated due to the law passed on July 13 that bans the use of hydraulic fracturing for exploration and production of hydrocarbons. The abrogated permits were held by Total E&P France, Devon Energy Montelimar SAS, and Schuepbach Energy LLC. Frédéric Briens, chief executive of European Gas, said "This announcement by the French Government confirms that our operations in France are not impacted at all by the new law that prohibits the use of the hydraulic fracturing technique in the exploration and exploitation of hydrocarbons. Envex has exercised its option to acquire another 23 per cent stake in NextGen from Green Invest. On 29 September 2010, Green Invest announced it was entering an incorporated joint venture with Climate Change Products Pty Ltd (trading as Envex) in relation to the carbon brokerage business of NextGen, and subject to milestones, Envex had an opportunity to increase its stake in the joint venture. Green Invest said it is pleased to announce that following the attainment of those milestones Envex has exercised its option to lift its stake in the joint venture from 51 to 74 per cent. Green Invest receives a payment of $1.1 million. It said it use the cash for working capital as it focuses on promoting its businesses in Australia and the US. Panax Geothermal has released a short video giving an overview of its geothermal development projects in the Asia-Pacific region, and of the working mechanics of the projects it is pursuing in Indonesia and Australia. The video is aimed at better informing its shareholders, stakeholders and interested parties of the company's expanding portfolio of projects and to demonstrate in a simple way the operation of the geothermal production, re-injection wells and geothermal power plants it is pursuing. Papyrus Australia Ltd has received US$100,000 as the initial non-refundable part deposit from the Egyptian Banana Fibre Company (EBFC) for machinery to establish the world's first commercial banana fibre production factory in Egypt through Papyrus Egypt. A 50/ 50 joint venture with EBFC, Papyrus Egypt is obligated to procure machinery, equipment and know-how from Papyrus Australia to the value of $2 million to enable it to operate the factory and conduct the joint venture. EBFC is solely responsible to fund the capital and initial operating requirements of Papyrus Egypt. The balance of the deposit, $400,000, is expected to be received by 30 November 2011. The balance of the $2 million for the machines will be received by Papyrus Australia in three $500,000 tranches - on completion of the machines and before their despatch by ship to Egypt, on the issue of an installation and commissioning notice by Papyrus Australia, and 60 days after the successful installation and commissioning of the machines in the Papyrus Egypt factory. Papyrus Australia has also entered an agreement with Egyptian company NAG-HAMADY Fiber Board Company, a manufacturer of MDF and other wood products from bagasse for the building and construction industry in Egypt and the Middle East. NAG-HAMADY is owned 50/50 by the Egyptian Government and the National Bank of Egypt. Its factory is proximate to the site selected by Papyrus Egypt for its banana veneer and banana fibre factory. NAGHAMADY is Egypt's largest producer of bagasse (the waste fibre from the extraction of sugar from sugar cane) and MDF panelboard, and is looking for additional sources of agricultural fibre for its growing business to export to Europe. The agreement covers four key areas. It permits NAG-HAMADY to test and trial the potential of banana fibre for the production of products for the building and construction industry. Fibre for the initial testing will come from Papyrus Australia's Walkamin demonstration factory. The testing regime will initially start with a mix of bagasse and banana fibres and proceed to 100 per cent banana fibre. Subject to successful testing and trialing, NAG-HAMADY will enter a long-term sale and purchase agreement with Papyrus Australia and/or Papyrus Egypt to procure banana fibre. It is anticipated that the annual production of banana fibre available from the first Papyrus Egypt banana fibre factory will be in the order of 5,000 tonnes per year on a dry basis. The price will take regard of local factors and in particular the price of bagasse fibre on an equivalent dry basis. NAG-HAMADY will contract with Papyrus Australia and/or its nominee to be its exclusive distributor of all MDF panelboard products it manufactures, including all bagasse panelboard currently produced, for the future sale of the products in the European Union. Petratherm's share purchase plan raised $458,500 at 12.5 cents per share. Chairman Derek Carter said the amount was very encouraging considering the challenging market conditions. The closing date for the offer had been extended several times, and during the offer the company's share price fell below the offer price. In a change of strategy, Phoslock Water Solutions is to focus its sales on Europe, North America and Australia, said chairman Laurence Freedman AM. Mr Freedman has been a shareholder almost since the company went public. He was invited onto the board 12 months ago and became chairman in March. Mr Freedman said his increasing involvement is because the company's product, Phoslock, has not achieved the commercial success it deserves, despite his conviction that it can be of enormous benefit to almost every water body in the world affected by the encroachment of phosphorus. As a board member he has focused on substantially increasing both sales and profitability. "The missing link in the past has been sales focus. The business has developed in Europe, but only slowly and not of any size anywhere else. In my opinion, the company had spent too much time and resources in countries in which it is difficult to make inroads and on matters unrelated to commercial success. "Management is now limiting the countries in which we concentrate and at the same time is seeking to maximize sales in those countries." The company's annual report shows that of $1.75 million of sales in 2010-11, 58 per cent were in Europe, 28 per cent in Australia and 14 per cent in North America. In Europe, Phoslock has now been successfully applied to more than 30 small to medium size lakes, and a substantial and growing pipeline for future applications is encouraging, said Mr Freedman. A few applications have been made in Australia but the level of sales continues to disappoint. "The United States is not only a huge potential market, but both governmental and private owners of water bodies are keen to achieve solutions to their water problems. Furthermore, they have a commercial attitude towards finding solutions. "A major licensing agreement was recently completed with SePRO Corporation. SePRO is a dynamic water solutions company, with national coverage." In Canada, the company is in the late stages of an application to the Holland River in Ontario that should lead to more take up of applications around the country. The aim is to make Phoslock an "off the shelf" product. Management is seeking as many external accreditation certifications as possible to give customers and regulators comfort that it is a widely accredited product and not feel the need to spend lengthy periods on individual testing procedures. "I am pleased to inform you that we have very recently secured a number of important industry accreditations which, I am sure, will reduce the time period in which Phoslock sales are made," he said. "For example, in the United States we have recently achieved some important approvals from the Federal Environmental Protection Agency (EPA). These approvals will enable Phoslock to either substantially reduce or eliminate the heretofore tedious process of individual water body testing." Style received acceptances for $544,652 from its rights issue that closed on 12 October, equivalent to 181,550,959 shares and 90,775,480 free options. The rights issue was underwritten by Peregrine Corporate Ltd for up to $2,087,000. The underwriter will take up the shortfall of 514,335,116 shares at 0.3 cents each and 257,167,558 free attaching options amounting to $1,543,005. Three Style directors participated in the rights issue. Peter Torreele directly and indirectly acquired 13,138,964 shares and 6,569,482 options for $38,416; Charles Gullotta indirectly acquired 10,516,666 shares and 5,258,333 options for $31,550; and Andrew Nuland picked up 6, million shares and 3 million options for $18,000.